In my house chicken is not that popular. So I try to not cook regular chicken curry. Need something extra for chicken or something different. Chicken Dopiaza is a chicken curry with lots of onion and less gravy which makes this curry more taste. For those people who don’t like chicken, please try this recipe. 1. Clean the chicken and drain water. Pat dry it. 2. Heat oil in a pan in medium and fry half amount of onion until it becomes golden brown. Take fried onion out and keep aside. 3. Add rest of onion, cinnamon, cardamom and bay leaf in the oil and fry until tender. Add salt and rest of spices except cumin and cook it oil comes out. 4. Add chicken. Stir well to coat spices with chicken. Cover the pan with a lid. 5. Cook in medium heat until all moisture evaporated. 6. Add ¼ cup of water and cook it. Continue to add ¼ cup of water and cook it till chicken is tender. 8. Add fried onion and cumin powder and cook another 2-3 minutes in low heat. 9. Remove chicken dopiaza from heat. 10. 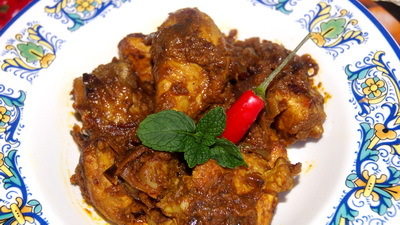 Serve chicken dopiaza hot with plain rice or roti. nice and easy!will try this ASAP.